For those who don’t know the Spanish island of Mallorca, located 209 kilometers/130 miles from Barcelona, there’s the danger of believing a few ill-formed rumors. There is talk that Mallorca is a hotspot for lager louts, but the true surprise is that you’ll really only find that crowd if you go looking for it. By staying at a Mallorca hotel, you will experience a wonderful island that boasts Spanish culture, rich Mediterranean beauty, and the pristine infrastructure of Germany, imported by the many Germans who make this place their second home (with a virtual collection of German-filled boutique hotels Mallorca feels like a Hamburg of the south). But unlike Hamburg, here glorious calas (or lagoons) offer up clear blue water tightly framed by rocky cliffs that serve as both a shelter and a natural marvel. 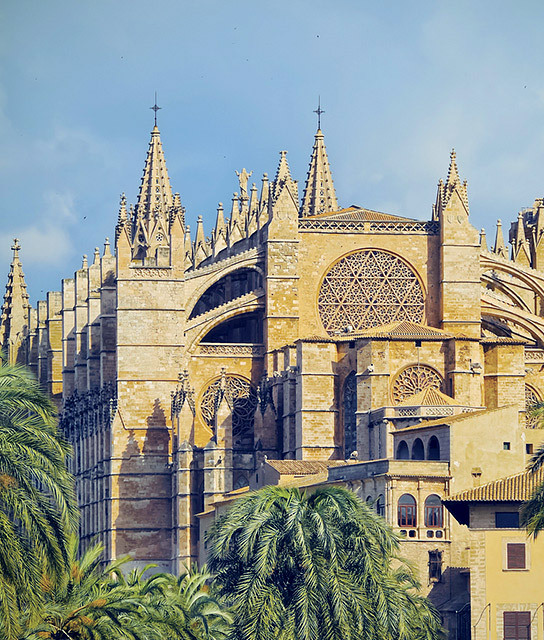 And the capital city, Palma de Mallorca, boasts the inspiring Palma Cathedral, back-to-roots cuisine, some of the best beaches in Mallorca, and packed hotels in Mallorca, as well as being a short drive from sights such as Cala Millor beach. Below find a list of our selection of boutique and luxury hotels Mallorca. Amid the narrow streets that crisscross Palma de Mallorca’s old town is a hotel with serene, spacious suites and a divine sun terrace. Located in the heart of Palma de Mallorca, Nakar Hotel is a place of peace and indulgence, complete with a rooftop terrace, a therapeutic spa, and a Mallorcan restaurant and bar. This fully updated 18th-century mansion in the heart of Palma is a design-lover’s dream and a culinary wonder.